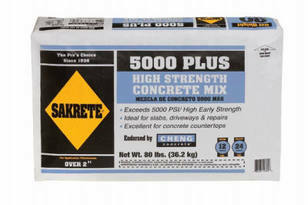 Sakrete 5000 psi concrete: High strength concrete mix designed for high strength structural applications. 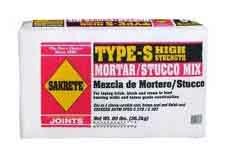 Sakrete type S mortar: A high strength mortar/stucco mix for the laying of brick, block and stone in load-bearing walls and construction above and below grade. QUIKWALL® Surface Bonding Cement: is an alkali resistant, fiberglass reinforced, portland cement based surface bonding cement used for waterproofing and strengthening block walls without mortar and rehabilitating existing walls with a water-resistant and decorative coating. 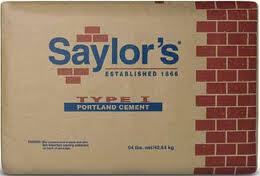 Portland Cement: Essroc Packaged Portland Cement is primarily designed for use in mortar to construct masonry walls with brick, stone, and concrete block. Essroc Packaged Portland Cement can also be used to prepare small batches of concrete. Play Sand: A screened and washed sand for use in playgrounds, kitty litter, gardens, etc. Sakrete Top n Bond: A polymer modified, sand and cement repair mortar for the resurfacing and patching of worn or chipped concrete surfaces. Superior bonding strength means long-lasting repairs. Planitop X: Fast-setting horizontal, vertical and overhead one-component repair mortar. Planiseal 88: is a one-component, polymer-modified, cementitious waterproofing coating for concrete and masonry surfaces. Mapei Quickpatch: Mapecem Quickpatch is a versatile, fast-setting, cementitious material used for the patching of interior/exterior concrete surfaces including concrete floors, driveways, sidewalks and concrete pads. Copyright © Milton Supply Co., Inc.